Nighthawk X8 Best Router On the Market? The Nighthawk X6 was and still is, a beast of a router. It was the perfect device for large families with multiple devices who needed speed and efficiency. Netgear even did some research conducted by Marketlab, which found that most families have over 12 Wi-Fi devices connected to a network. Now, the Nighthawk X8 AC5300 is the next step up in delivering performance. Let's talk about what kind of power this bad boy can put out. It's good to hear that the Nighthawk X8 AC5300 still leads the charge with its new tech, as this time around it uses the new second generation XStream platform technology to deliver three tri-band wave channels with two 4x4 5 GHz radios (2.1 Gbps) each and one 4x4 2.4 GHz radio (1 Gbps). 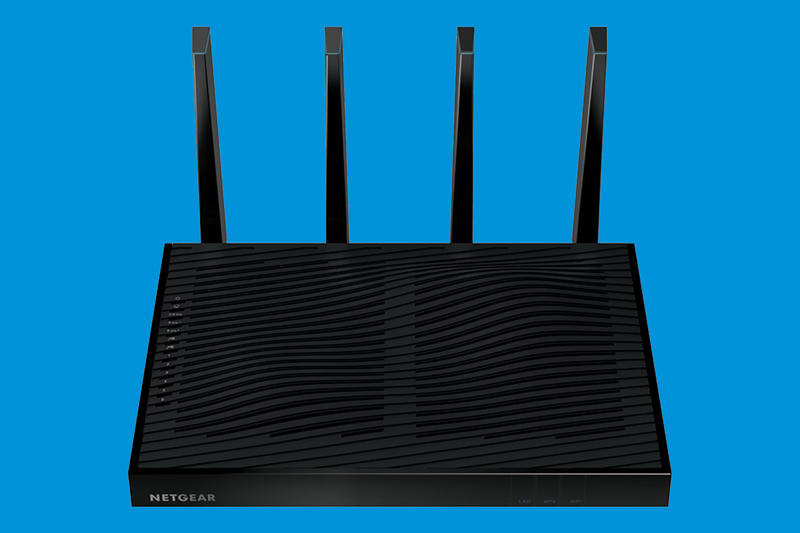 The Nighthawk X8 AC5300 is capable of 5.3 Gbps over a wireless signal and powered by a 1.4 GHz dual-core processor. The X8 is a bit different than the X6, as far as the design. Instead of utilizing eight antennas on the outside (goodbye spaceship) it now uses four antennas on the outside and four in the inside. The four external antennae are active with Wi-Fi amplifiers located in the tips of the antennae. The location of these antennae is very efficient, and unique in reducing signal loss and cross-talk on the board to deliver a new quality of Wi-Fi signal. There aren't any other routers with this external use of Wi-Fi amplifiers. Netgear's senior director Sandeep thinks this feature and others make the router “outpace any router in the market today.” He very well might be right, as another notable feature included on the X8 is the six Gigabit Ethernet ports that are great for multi-ethernet cable use. The Nighthawk X8 also comes with many standard features in common with its predecessors like beamforming, dynamic QoS, VPN, two onboard USB 3.0 ports, and DLNA support. It also utilizes smart connect features. Harpalani believes that the "Nighthawk Nighthawk X8 AC5300 is the next big wave in Wi-Fi, and it is for people who crave the best networking experience possible." The Nighthawk X8 AC5300 is made even stronger with pre-flashed VPN software, like Torguard VPN. VPN-enabled routers ensure your entire Wi-Fi network will be encrypted through a VPN server.